Sometimes our furry friends are more than just pets. Dogs, cats, and other domesticated animals provide much-needed help and companionship for those with disabilities. If you have been wondering how to make your cat an emotional support animal, USA ESA can provide you with the emotional support animal documentation you need. Order your ID kit online today. Why Get Documentation for My Pet? Whether it's your cat, bird, hamster or other pet that provides necessary comfort to you, others may view your companion as a nuisance. Many businesses don't allow pets on their premises. While not required by law, registration materials including ID cards, certificates, and identifying collars and tags help to reduce hassle and questioning, and many businesses, airlines, and hotels will be more than happy to allow your furry friend inside the premises when they know your companion animal is more than just a pet. Save yourself stress. Get your emotional support registration from us today. Why Get My Registration From USA ESA? When you order your emotional support animal registration from USA ESA, you won't have to worry about being given false information or receiving unfriendly customer service. We genuinely want to help you live a better life, and we are committed to informing and assisting our customers in any way we can. We love answering questions about emotional support animal registration and documentation, so feel free to give us a call at 888-656-3647 or to email us at orders@emotionalsupportregistration.org. Click on the links below to order your registration, and be sure to check out our FAQs page for more information. 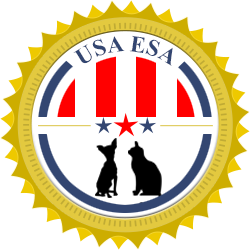 USA ESA provides registration ID cards, certificates, ESA vests, ESA leashes, and ESA tags, plus instant electronic delivery of your emotional support animal ID card within minutes of placing your order at no extra fee. Service dogs assist those with impaired mobility, vision, or other disability. They are defined in the ADA as dogs specifically trained to help their disabled owner accomplish a task. With proper paperwork, service dogs are allowed to fly with you in airplane cabins at no extra cost and may accompany you to restaurants, movie theatres, hotels, etc. Emotional support animals (ESA) aid others who may suffer from general anxiety problems or during stressful events like airplane flights. ESAs may be any species of animal (dog, cat, bird, etc.). They are covered under the ACAA and FHA. With proper paperwork, emotional support dogs are allowed to fly with you in airplane cabins at no extra cost and live with you in housing regardless of a dorm or apartment building's pet policy. Under most circumstances the ESA may also accompany you to restaurants, movie theatres, hotels, and some other businesses. Therapy animals usually serve patients in a hospital, nursing home, or palliative care settings by providing companionship and affection. The are not covered under any federal laws. Therapy animals may be any species of animal (dog, cat, bird, etc.). The Fair Housing Act and Air Carrier Access Act allow people with valid emotional support animals to live with their animals in most housing units (such as apartment complexes, college dorms, trailer parks) and benefit from their company during travel (such as airplane cabins) without discrimination or extra fees. Additionally, many businesses recognize the need for people to have their emotional support companions with them to help them live an easier life. USA ESA offers lifetime registration of your ESA. We allow Service Dog registration (through our sister site, USAServiceDogs.org), Emotional Support Animal registration, and Therapy Animal registration. Additionally, you can purchase one of our physical registration kits, all of which complement your registration with instant printable ID cards, high quality physical ID card and holders, optional ESA leashes, ESA vests, and a certificate from USA ESA documenting the proper registration of your emotional support animal, which you can bring with you wherever you go for a hassle-free experience. It's important to always be able to show proof of your service dog or emotional support animal registration. Your registration at EmotionalSupportRegistration.org will be valid for the lifetime of your animal. Anyone can verify details about a registration on our free ID lookup page at EmotionalSupportRegistration.org/lookup.